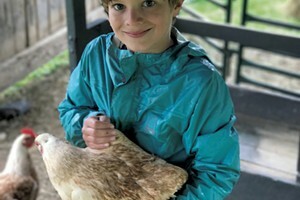 Farm-Raised Kids: 4-H Members Share What They've Learned About Animals — and Themselves | Features | Kids VT - small people, big ideas! Founded more than a century ago, 4-H is the country's largest youth development organization. Through its clubs, camps, competitions and clinics, the program reaches nearly six million kids ages 5 to 19 in the U.S. — including around 6,000 in Vermont, according to the state's program director Sarah Kleinman. Attend a county fair or visit a local farm and you'll likely spot the 4-H emblem — a green clover with a bold "H" on each of its leaves representing Head, Heart, Hands and Health. The program was started as a way of passing along agricultural knowledge. Though today's club members can choose from a menu of projects that includes engineering, community service and performing arts, 4-H still retains its ag roots. 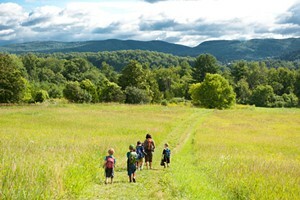 In Vermont, 4-H clubs are overseen by the University of Vermont Extension. Club members here rely on around 500 adult volunteers and 150 older youth helpers for guidance, but the kids themselves run the clubs and decide which projects to pursue. There's no "instructor" in the traditional sense — in 4-H, participants learn by doing. If there are any teachers, you might say they're the farm animals. Livestock projects remain a staple of the 4-H experience. In many cases, the kids are learning about the animals through their relationships with them. 4-H'ers might learn to assess an animal's vital signs and groom it, explained Rose Garritano, a 4-H educator for Chittenden County. Participants can also "show" their animals in competitions that test kids' knowledge, handling and presentation skills. 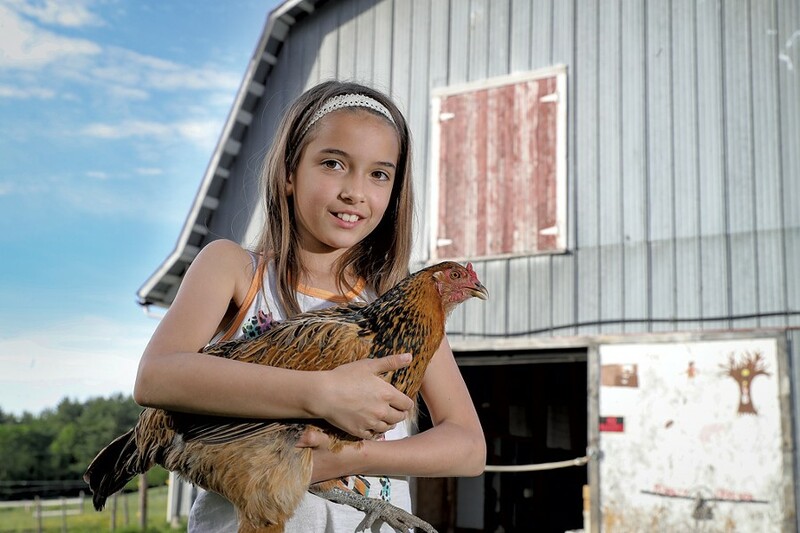 4-H doesn't provide its members with animals, though often kids can lease them for a small fee. Kids VT visited two of Vermont's 125 4-H clubs to hear about the program from the kids themselves. Kim Johansen has been a 4-H leader for 25 years. She and her husband, Scott, purchased an old cow farm in Hinesburg and converted it to what is now the Livery Horse Farm when their daughter, Gabrielle, was 2 years old. In addition to teaching private lessons and running horseback riding camps, Johansen currently leads a 4-H club of around 14 members along with Gabrielle, now 27. The group's focus is on both horses and community service; they call themselves the Midnight Riders. On a sunny Saturday in June, pony- and pigtailed girls sporting riding britches and T-shirts milled around Johansen's weathered red barn, tending to some of the 19 horses that reside there. The stable houses a wide variety of equines, explained the flaxen-haired Johansen, from animals she's rescued to "upper-end show horses." 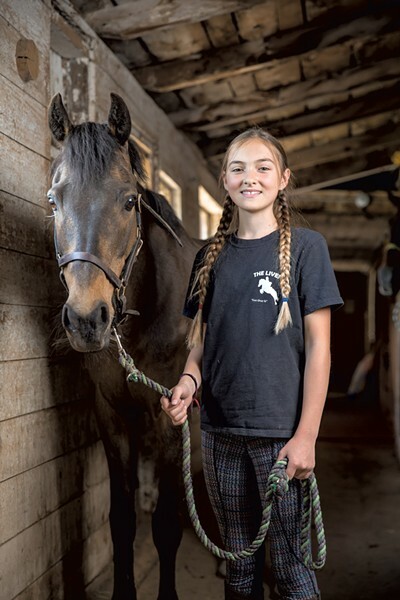 The girls brushed and braided the horses' coarse hair, weaving small yellow flowers into the mane of a 21-year-old pony named Peaches who, by Johansen's estimation, has taught thousands of kids to ride over the years. The girls then tacked up some of the horses in preparation for an energetic group drill they were practicing for an upcoming horse show — and spent a few minutes talking with a reporter. 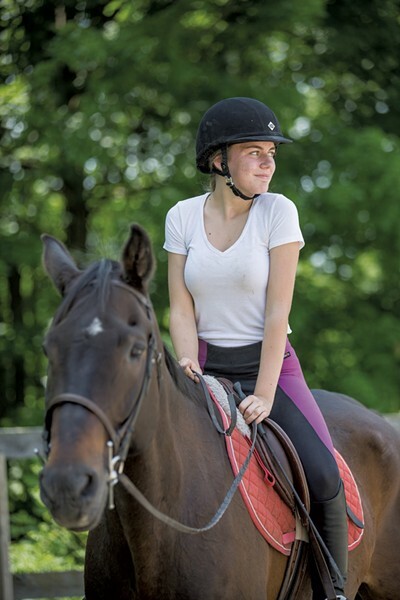 The rising high school freshman, who says she spends "pretty much every day during the summer" at the barn, comes from a family of horse riders. 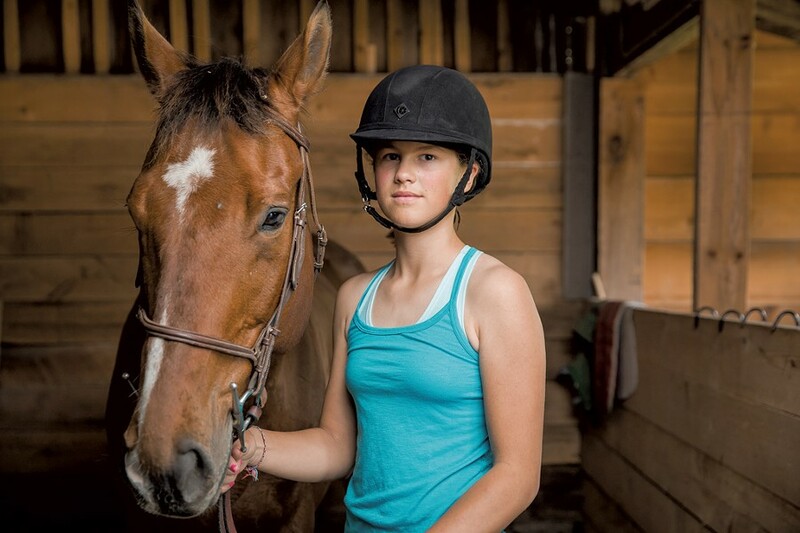 In her five years of 4-H membership, Phoebe says her proudest accomplishment was being named weekend champion at a horse show in Addison County — an honor that came with a huge trophy she displays in her room. Yeah, my favorite horse is Merlin. He's really calm and he's kind of just like a big teddy bear. He loves to snuggle and he's super sweet. What are some of the things you've learned about horses? We did one project where we learned about Potomac Horse Fever. We learned about all the symptoms and how you can treat it and how you can prevent it. It's basically like a fever that horses can get from drinking water with a parasite in it. We learned about how to keep your water clean and prevent the little bugs from getting into your barn. After we learned about that, we all made sure we were scrubbing our buckets and turning the lights off in the barn at night. What are the horse shows like? You get there and put your horse in your stall and take care of them and brush them so they look really nice. There's one judge who will tell you what to do — to walk or trot or canter — and then you all line up and they announce your places. There are different classes: there's pleasure, which is like how pleasurable your horse is and how nice they are, and there's equitation, which is how you look on your horse and how you're riding. Can you talk about the relationship you've built with other 4-H members? It's a really close group of friends and we're very welcoming. It's kind of like a family. 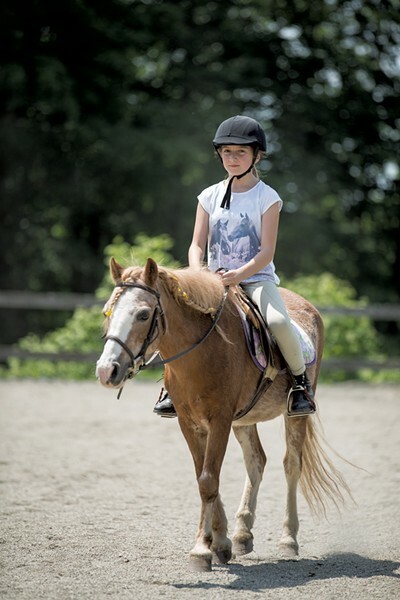 Athletic and well-spoken, Vivie has been riding horses since she was 6 years old. She joined 4-H at age 8, and has been participating on and off since then. As she talked animatedly about working with obstinate horses, it became clear she enjoys a good challenge. The camaraderie she's developed with 4-H members of all ages is also one of the things she's enjoyed. "It's all about learning, having fun and building relationships you wouldn't really expect," she explained. What are some of your favorite 4-H activities? I like the interactive games — learning by doing — so, like, learning how to braid a horse's mane by grooming the horse and braiding it yourself. If we were to learn about vaccinations of the horse, I want to see the vet do it instead of just hearing about it because you learn on a different level when you're doing it. Tell me about some of the horses you've worked with and what they've taught you. I worked for about two and a half years with a large horse. Her name's Star. She was in the field for like 17 years and I took her out of the field. She was a brat. The second year I was leasing her I brought her to horse shows. She was kind of crazy. We got kicked out because she would buck and take off. I still love that horse a lot. She's a stubborn horse but she taught me more than a horse that did everything I asked would. I've moved on to a different horse who has challenges of his own. His name is Mack. He's been to a lot of homes where he hasn't been treated properly, so he's still trying to overcome some of those fears. At one point you couldn't tie him to a fence because he thought someone was going to hurt him. Horses are amazing and they teach you a lot more than just riding. With Star it was patience. That's a life skill everyone needs to know. You're going to work with difficult people no matter if you want to or not. As a rider, she taught me how to stay on. With Mack, one of his things is he likes to go really, really fast and be uncontrollable so that obviously made me really strong, but it also taught me patience and that not everything comes overnight. Do you spend a lot of time with the horses over the summer? I ride my horse four times a week, and I also help out with camps all day. I don't really want to be out on the boat tubing. This is my summer. This is my home. It's where I prefer to be and where I'm comfortable. Neika participates in 4-H with her older sister, Ella. During the summer months, she helps out at Livery's riding camps, walking younger kids around in the ring. Sometimes they're scared, she said, "but usually they're just really excited to ride a horse." What are some of the things you've enjoyed in your three years in 4-H? I really enjoy doing community work and doing volunteering. We've done community meals and Green Up Day, and it's really fun to do it with friends and interact with different people we haven't met before. Do you feel like you really get to know horses' personalities when you ride them? Yeah, like some of them are really shy and some are really forward. I usually ride Skippy because he is really good at shows and has been to lots of horse shows. Moxie, he isn't as good with ground work — that means like walking around with your horse. He likes to bite sometimes. But we're breaking the habit. You just have to kind of stop them, yank them and show them it's not okay. Sometimes you can tap their nose a bit. It doesn't really hurt them but it shows them. Most horses do [learn quickly] but Moxie's a different story. Have you had any mishaps while riding? I once fell off of a mini pony. These two younger kids were riding bigger horses and so they got really close to me and he got a bit spooked and he halted and I just fell off forward. When you fall off a horse, it's kind of like, Oh, I just fell off! and sometimes it just hits you emotionally, I guess. I didn't hurt myself at all. I just got sad. Olivia, who's entering middle school next year, had seen posters around town advertising 4-H, but wasn't sure exactly what it was until her friend told her she should try it. She's been doing the program for under a year and said she really enjoys it. Are there certain horses you like to ride? Right now I'm riding Peaches because I'm showing her next weekend, and Flower is also really nice. I like Peaches because she can keep her trot going and she's really sweet. A lot of the little kids ride her so she's really calm and doesn't buck as much. And Flower can't keep her trot as long but she's really calm as well. I like more calm horses. It keeps me calmer on the horse. How do you prepare for horse shows? This is my first show coming up but I've been to my friend's show. You have to braid the horse, clean it off, make sure its whole body is clean. I have to clean off my boots. There's a lot of work you have to do for the shows. I'm a little nervous, but I'm looking forward to it. I'm doing one day out of the two days. I have seven events on Saturday. I don't know all of them, but one of them is trail. The trail course, it's like an obstacle course. Usually there's a mailbox and a gate you have to open. It's pretty cool. The High Hopes 4-H club meets once a week on a 75-acre farm in Fairfax, owned by group leader Amanda Gifford and her husband, Paul Baumier. The couple shares the property with their seven horses, seven cats, a turtle, and 85 ducks and chickens. The property also serves as the campus of Avalon Triumvirate Academy, Gifford and Baumier's small, independent school for kids in grades 4-12. Gifford founded High Hopes 23 years ago when she and Baumier lived in Colchester. They've moved twice since then — once to Swanton, and then to Fairfax in 2003. Both of their grown children participated in the 4-H program. Today Gifford estimates there are 15 to 20 kids in their club, depending on the time of year and sports schedules. High Hopes kids can take part in riding projects with the horses and they handle many of the birds — though not all of them, notes project leader Mary Ellen Tourville, whose kids, Ali and Joe, are part of the club. "We don't really want to make relationships with the meat birds," she said quietly during a poultry project meeting one weeknight in June. That's not to say that the kids don't talk about death. Dealing with an animal's demise is one of the inevitable life lessons kids learn through 4-H. "I can't tell you how many of everyone's best friends are buried here," Gifford observed. Most of the lessons are less dramatic. "I'm looking for kids to learn the life skills, not necessarily the poultry skills," Gifford offered. "I want them to learn public speaking, time management." The learning process can also be comical. At that poultry project meeting, 10 kids gathered in a circle, while the adults looked on. Some 4-Hers held chicks or ducklings, others had full-size hens. "Awww, you pooped on me!" complained one girl. Another girl struggled to get her chicken into its crate; it broke free, and a group of kids and adults scrambled to corral it. Quipped Gifford: "It takes a village to catch a chicken." The genial, self-possessed teen is the High Hopes club president. His 3 1/2 -week-old Ancona duckling is a new one; his first duck, a Rouen named Mrs. Quackers that he leased from Gifford for three years, went missing recently — a likely victim of predators. He hasn't named the new duck yet; it squawked loudly while Zach talked to a reporter. He lovingly stroked her head to calm her. "She's just a little nervous," he said. Why did you get involved in 4-H? I started going four or five years ago. A lot of it was that it was a good way to get into hobbies, like cooking, drama, animals. What do you do as club president? I write the agendas for the business meetings and keep the club intact during the meetings. I've learned a lot about leadership and working as a team with other people. What was it like, showing Mrs. Quackers at the Champlain Valley Fair? It was a lot of fun. We went early with the birds; we got the birds cleaned up and settled, then we got to walk around a little. We got dressed up — white button-up shirt with dress pants. It was kind of cool because we were all fancy, and it felt like you were important. Sometimes I'm a little bit late on writing the agendas. It was kind of hard, losing Mrs. Quackers. You kind of form an attachment. I used to come here every Wednesday for horseback riding. I would spend so much time with her. It was kind of cool to go back to school and say, "I have a pet duck." But, you know, you get through it. You move on. In 2016, Miranda was the Vermont winner of the national Healthy Lunchtime Challenge; last summer, she and her mom went to lunch at the White House and met Michelle Obama. Her winning recipe was a chicken salad wrap with maple-glazed veggies. This summer, instead of serving chicken, she's preparing to show her Americana hen at the fair. Fawn, like the deer — as you can see on her feathers are little cloven footprints. Have you shown her at the fair before? This is my first year showing. No experience. At all. Whatsoever. Why do you want to show your chicken? One reason I don't want to do it is I really don't want to have to study every single part of the bird. I do want to do it, because I really want to know if she has all the exact traits of an Americana. What have you learned through 4-H? Showmanship and incubation of chickens, parts of the chicken, baking, general cooking. No, no! I would never do that in front of my chicken. Why do you like animals so much? Because they're colorful, fuzzy, feathery, scaly. And they're really good listeners. Sam is one of three Hurteau siblings in the High Hopes club; his brothers Porter and Toby are also members. 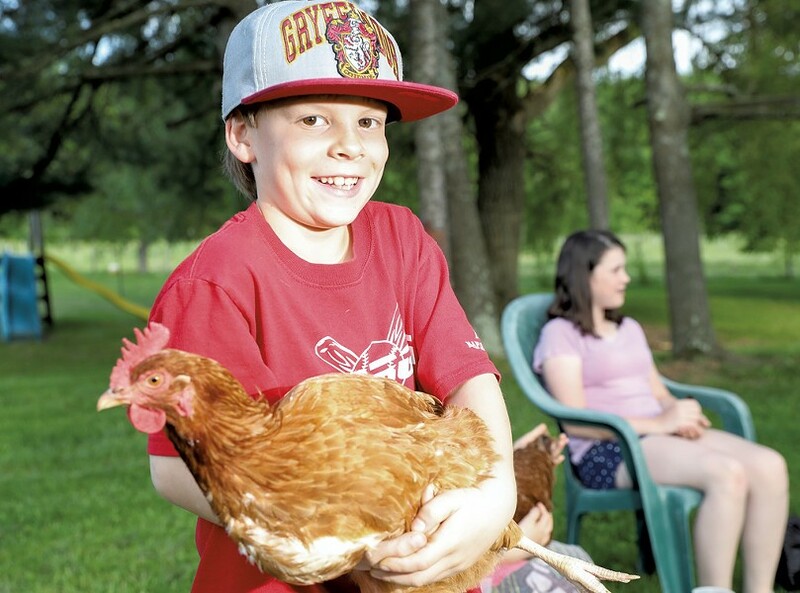 Sam was one of the smaller kids at the poultry project meeting, but he spoke confidently about handling chickens — his family has 10 of them, including Sam's Rhode Island Red, named Fluff, which he hopes to show for the first time this summer. What do you like about 4-H? I do baking. I think that's really fun. And I like just handling all the animals. They kind of keep me company. Are you nervous about showing your chicken at the fair? Yeah, a little bit. I really don't want our chickens to jump around a lot. We keep on handling them as much as we can. How do you handle a chicken? You stroke it the way the feathers are going, otherwise they get ruffled. Just picking it up, it always calms down a lot just because it has someone — some company. To Get, or Not to Get, a Pet?